I learned a lot at Chris Ducker’s Tropical Think Tank this year, but the big lessons were not what I expected they would be. In this episode, I share some of the key life lessons I took away from the event. Other attendees have done an amazing job of summing up what each of the speakers had to offer, so I wanted to focus on some of the more personal reflections that came up as a result of being surrounded by 60 like-minded, high vibe entrepreneurs for 13 days! If you are feeling overwhelmed, lacking in self-confidence or just need some inspiration to create a bigger life for yourself, this episode is for you. If you’ve thought about or recently made the leap into entrepreneurship, but you’re finding the journey overwhelming, I want to help you land on two feet and gracefully overcome the challenges that stand in your way. You can do it. You are doing it… as am I. We are in this together! Through the stories my guests and I share on Your Brilliant Un-Career, the Podcast, I aim to help you shift from stuck to inspired, from dreamer to doer. This podcast is proudly brought to you by my bestselling book: Your Brilliant Un-Career: Women, Entrepreneurship, and Making the Leap, out now on Amazon. 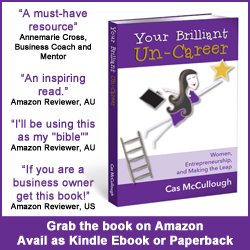 http://bit.ly/uncareerp (Paperback version) http://bit.ly/uncareer (Kindle version), and Writally.com, a new startup to help business bloggers create high-quality content in half the time. Join the beta testing community here: http://writally.com/group! I am the author of Your Brilliant Un-Career and How to Create a Magnetic Marketing System, both available on Amazon. After a near death experience, in 2010 I founded my first startup and now juggle running a successful content marketing agency, a tech startup, and my online training programs from my Brisbane-based home office while solo parenting and home educating my three boys. To avoid growth-based burn out you need to build a great team around you and occasionally take a break. What do you want to get out of business events? A great question to ask before you commit to any. Big is not always better. What defines happiness is not about whether your grass is perfect or whether you have a beautiful house or live a life of luxury. Sometimes I think if we are present to our own reality and realise that happiness is not that thing over the end of the rainbow, but something we’re meant to be living in each moment and living in gratitude for each moment, we’d be happy now. On unworthiness: When you have a low opinion of yourself it gets in the way of building relationships with other people because you always have this sense that you don’t deserve that. There are lots of things that happen in our lives that cause negative underlying beliefs that can create the behaviour we’re hoping to avoid. Our default isn’t necessarily to criticise. Generally, we want the best for others. If you’re feeling unworthy, or you’re feeling like you’re not good enough, I want to encourage you to look at yourself the way others do. You’ve got to learn to say “no” for your own self-preservation. If you’re not going with your flow, you’re going with someone else’s flow and being taken off on another agenda. Life can be so much bigger. We tend to cocoon ourselves and live in a bubble. I’m going to banish self-doubt. As entrepreneurs, we need to deal with all that internal conflict that comes up because it effects us in how we perform, and in how we relate to others. If you don’t back yourself, how can you expect anyone else to. Don’t hold yourself back. Just address what’s getting in the way, and move forward. Be strong in your boundaries. Your Brilliant Un-Career features a bonus private podcast interview with EFT Practitioner and author Sally Thibault. Listen in for some encouragement and affirmation that you are enough, just as you are and read Chapter 11 of Your Brilliant Un-Career for 7 tips to overcome emotional and psychological barriers to your success. Access this interview for free here, along with 32 other bonus business building podcast interviews, templates, worksheets and motivational affirmations.